Anthony Campagna was a developer responsible for the demolition of Greenwich Village’s “House of Genius” and the Brokaw Mansion. People: Willa Cather, Frank Norris, Alan Seeger, Robert F. Wagner, Jr.
Anthony Campagna’s planned demolition of the “House of Genius” in Greenwich Village ignited a preservation battle to preserve this collection of row houses. In the 1940s, Anthony Campagna had bought up the "Genius Row" houses at Washington Square Park South between West Broadway and Thompson Street. His plan was to demolish these historic structures in order to build three high-rise apartment houses with 302 family units.4 The "House of Genius," a row house on the block Campagna purchased, had served as a cultural and artistic landmark for Greenwich Village residents. Originally a single-family dwelling, it was converted into a boarding house by Swiss-born Mme. Branchard. Branchard exclusively rented to writers, artists, and musicians.5 Many notable guests passed through the "House of Genius" including Willa Cather, Frank Norris, and Alan Seeger. Contemporaneous to this time was the special committee Mayor Robert F. Wagner, Jr. formed to address the issue of safeguarding historic structures. This committee, later known as the New York City Landmarks Preservation Commission, had drawn up a list of buildings that were architecturally and historically significant and therefore worthy of protection. 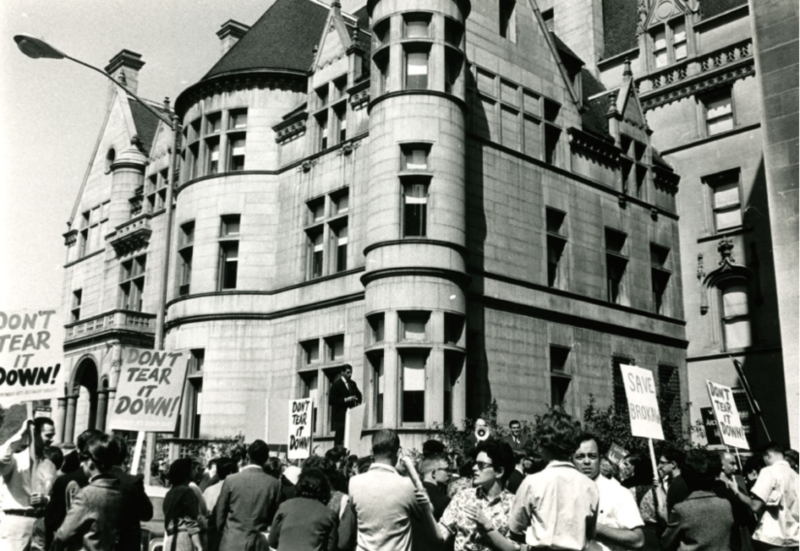 The Brokaw Mansion had been listed on September 23, 1962, however the Commission had no legal authority to protect the mansions from demolition.11 The Commission had drafted legislation, the New York City Landmarks Law, which had passed by city council and was awaiting Wagner's signature. Ironically Mayor Wagner declared the week of September 28-October 4, 1964 “American Landmarks Preservation Week in New York City,” as the fate of the mansions remained tenuous.12 In an urgent telegram to the mayor, the Municipal Art Society, the American Institute of Architects, the Architectural League, and the Fine Arts Federation pressed the mayor to sign the Landmarks Law in order to protect the Brokaw Mansion.13 The battle was lost when the mansion was demolished on February 6, 1965. A year later, Campagna had built a 26-story cooperative apartment building. However, this event only fueled the fire for the preservationist movement to get the New York City Landmarks Law passed. ”Anthony Campagna Dies at 84; Led School Building Program,” The New York Times, 9 May 1969. ”Villagers Strive to Save Landmark,” The New York Times, 13 December 1947. ”Mme. Branchard of ‘Village Dead,” The New York Times, 10 January 1937. ”Village Evictions Ordered by Court,” The New York Times, 24 January 1948. Lee E. Cooper, “‘Genius Row’ Sale to N.Y.U. By Builder Arouses Village,” The New York Times, 16 July 1948. John Freeman Gill, “Goodbye to All That,” The New York Times, 3 April 2005. Anthony C. Wood, Preserving New York: Winning the Right to Protect a City’s Landmarks (New York: Routlege, 2008), pages 1-2, and 19: endnote 3.